The producers just completed a week of shooting in El Paso, Texas. Footage covered background material for the story on the efforts to save the Plaza Theatre; the social, political, cultural, and geographical influences impacting the city's efforts for revitalization of downtown via the theatre. Jeff interviewed real estate developer and investor Tanny Berg who has been very involved in downtown redevelopment projects over the years. Mr. Berg saved the Palace Theatre from an uncertain fate. 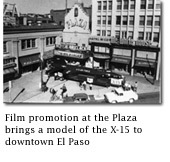 This Interstate theatre was the sister of the Plaza, located only two blocks away. It is also the theatre at which Jeff Mills's father worked as a young man.